My blog is more than 100 posts old but one thing was missing in the line of recipes...a KOFTA dish. Also, the theme of our next blog hop event happened to be "Kofta dishes " too. 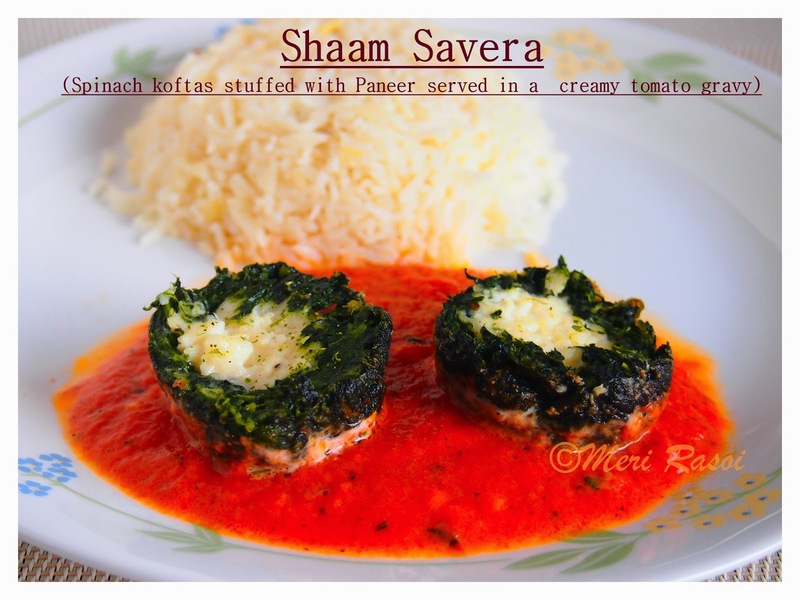 So my first Kofta dish had an added importance:) I wanted it to be something rich , tasty and visually appealing.Hence I chose "Shaam Savera". 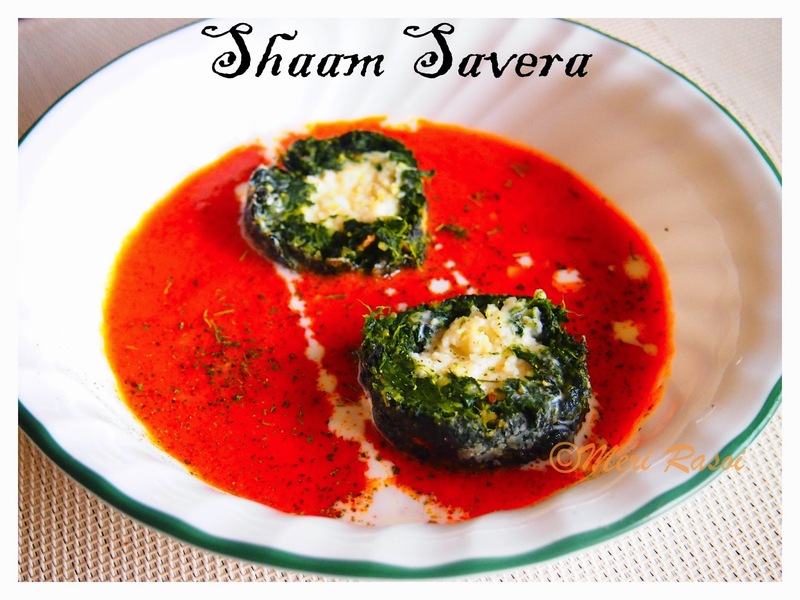 Shaam Savera is a restaurant style kofta dish. 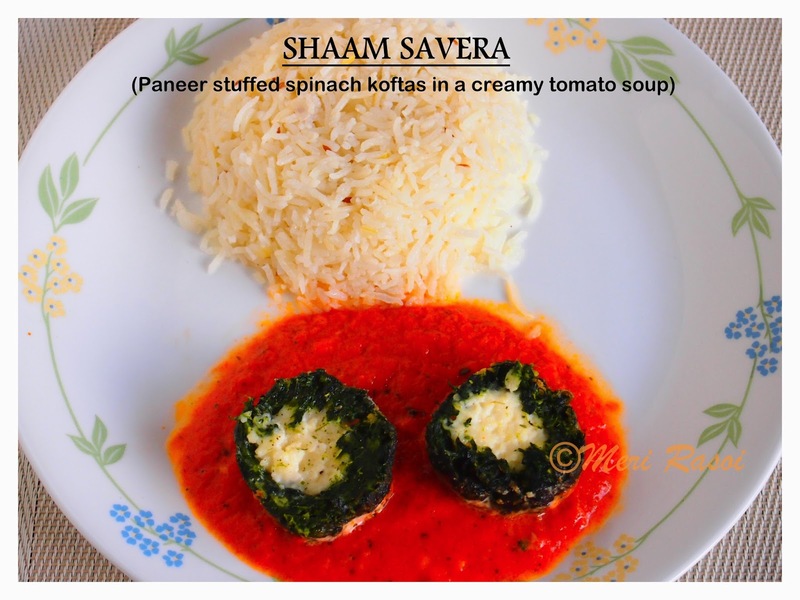 Spinach koftas stuffed with cardamom flavored paneer (cottage cheese) are served in a creamy tomato gravy. I first tasted this dish during my beginning days in the US. A dear friend had invited us for dinner and Shaam Savera was the main dish on the table. Later I saw the same dish in a cookery book by the great Indian chef Sanjeev Kapoor. I tried the recipe by the great chef making few changes to suit my taste buds. I was very happy with the result. The dish not only tastes good but is a visual treat. Clean and wash the spinach. Blanch the spinach in hot boiling water for just 3-4 minutes (we do not want to cook spinach more than that). Drain and run some cold water through the drained spinach (this is to prevent further cooking of the spinach). Squeeze out the excess water from the spinach. 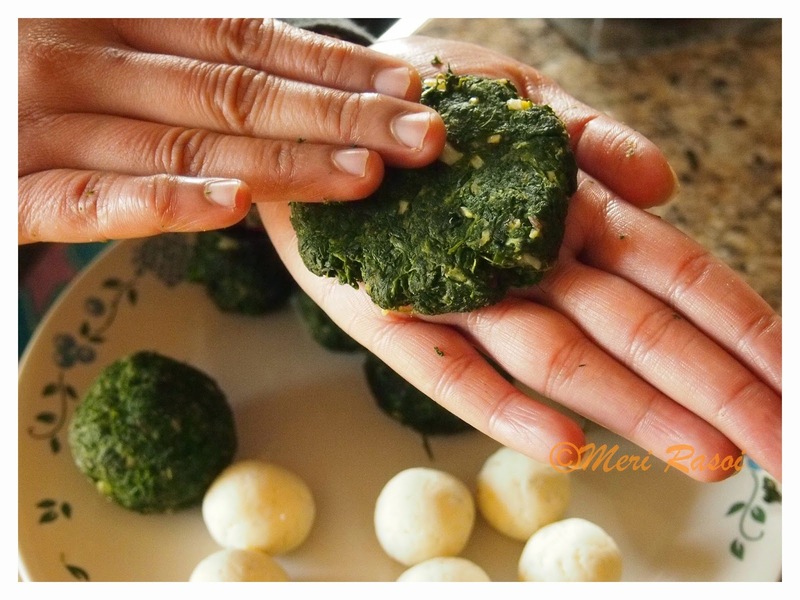 Chop the spinach finely and set it aside. Grate the paneer. Add 1/4 tsp of cardamom powder and salt to the paneer. Mash the mixture well until it comes together into a ball. Divide it into 9 balls. Heat 1 tbsp oil in a pan. When hot, add the cumin seeds. Once they start to splutter, add the chopped garlic,chopped chillies and saute. Add the chickpea flour and mix until the rawness of the flour is gone. Add the chopped spinach. Add the turmeric powder and little salt (Be very careful while adding the salt as a little goes a long way while adding salt to spinach). Keep cooking until all the moisture from the spinach has gone. Once done, turn of the heat. Set the mixture aside to cool. Once the spinach has cooled, make 9 equal portions of it. 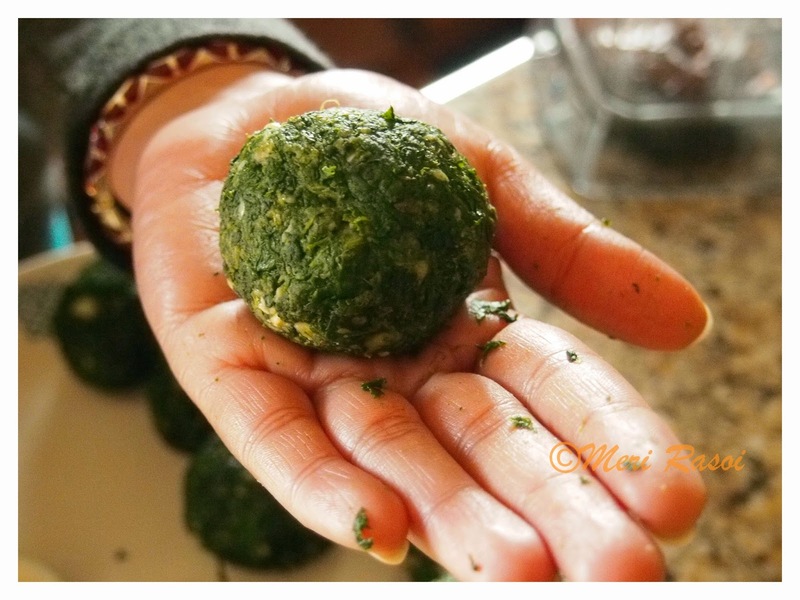 To make the koftas, take a portion of spinach and flatten it. 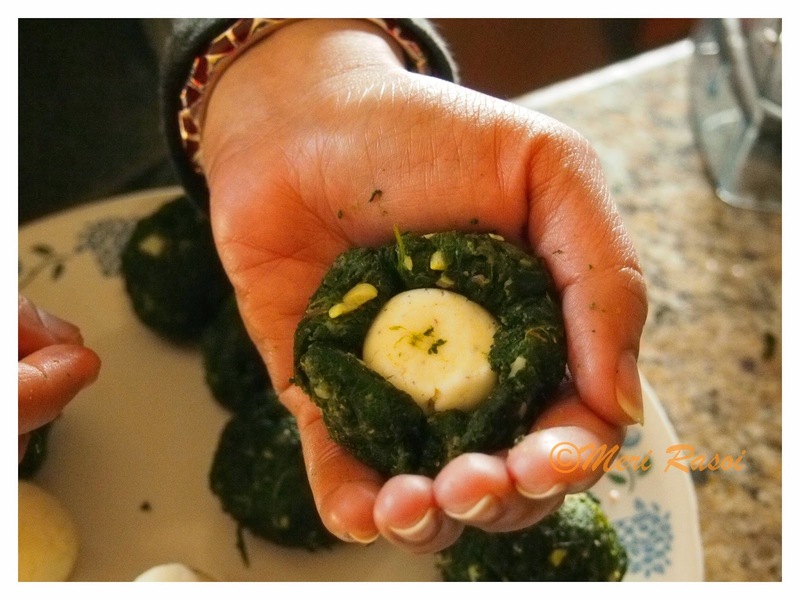 Keep a paneer ball at the center of the spinach mixture. 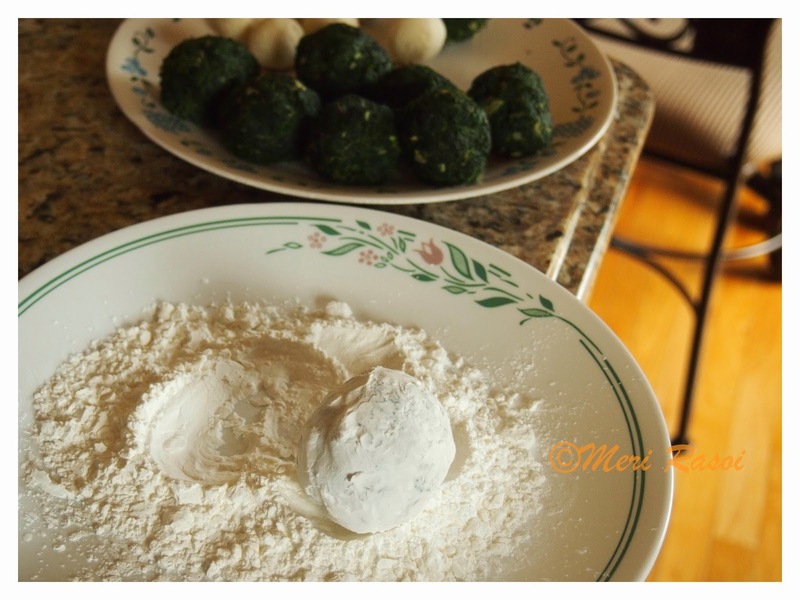 Gather the edges of the spinach mixture and shape it into a ball. 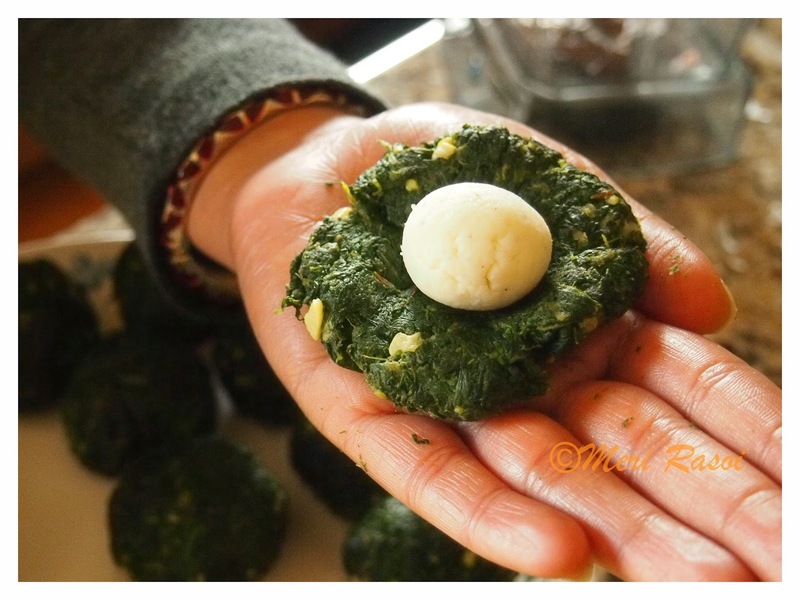 Press firmly so that there isn't any air pockets between the two layers.Repeat the process with the other spinach portions and paneer balls. Take some cornstarch in a plate. 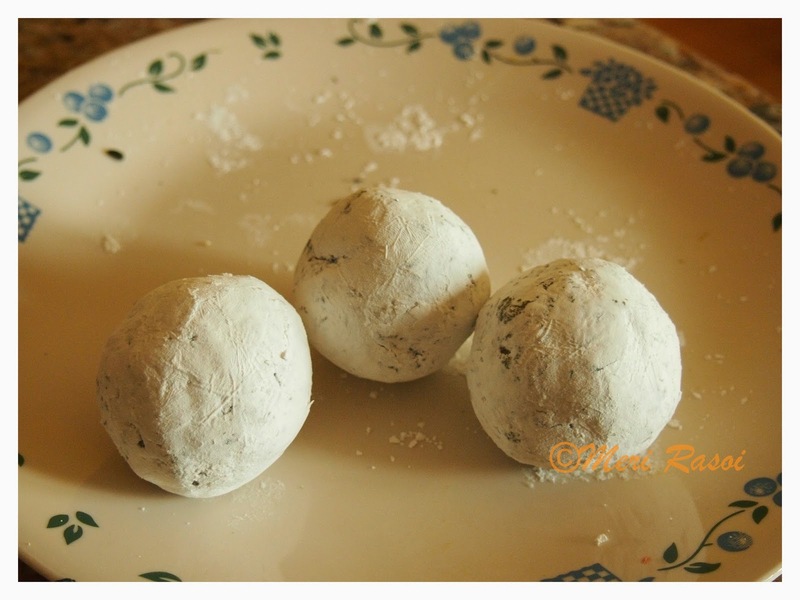 Roll the stuffed balls in it. Dust of the excess cornstarch by tossing it between both palms. Heat oil for deep frying. 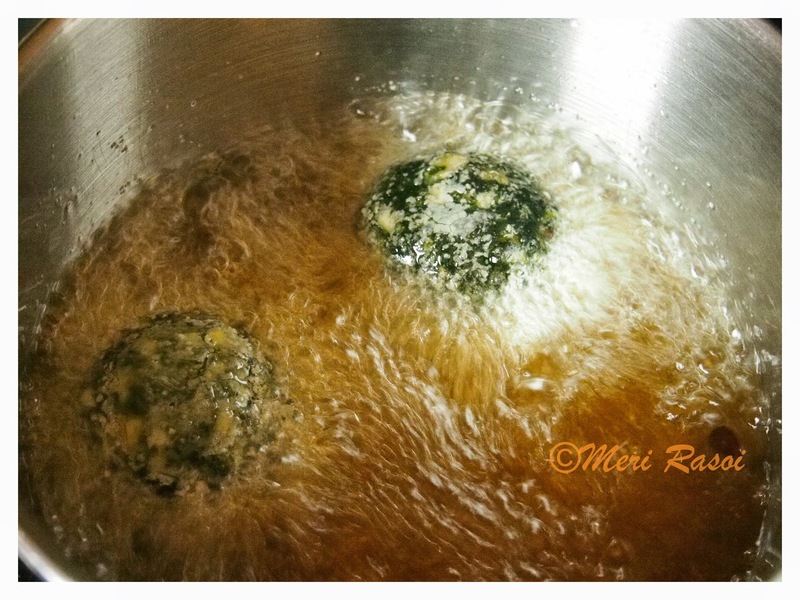 When hot, gently slide the cornstarch coated balls in to the oil and cook them on medium heat. Fry until golden . Drain it on a paper towel or any absorbent paper.Repeat the process with all the balls. Heat 1 tbsp oil in a thick bottomed pan. When hot, add the cinnamon, cardamom and bayleaf. Add the chopped garlic, saute until the rawness goes away. Add the pureed tomatoes. Mix well. Cook on medium heat. Add salt, butter, garam masala, cardamom powder and the degi mirch chilli powder.Cook until the tomato puree is well cooked . 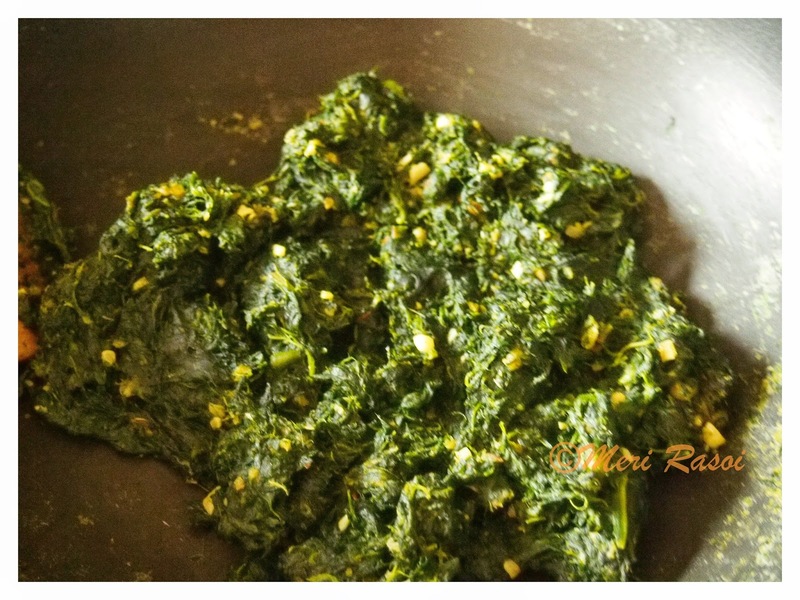 Heat the kasoori methi in the microwave for about 10 seconds. Rub it in between the palms and crush it. Add this to the tomato gravy. 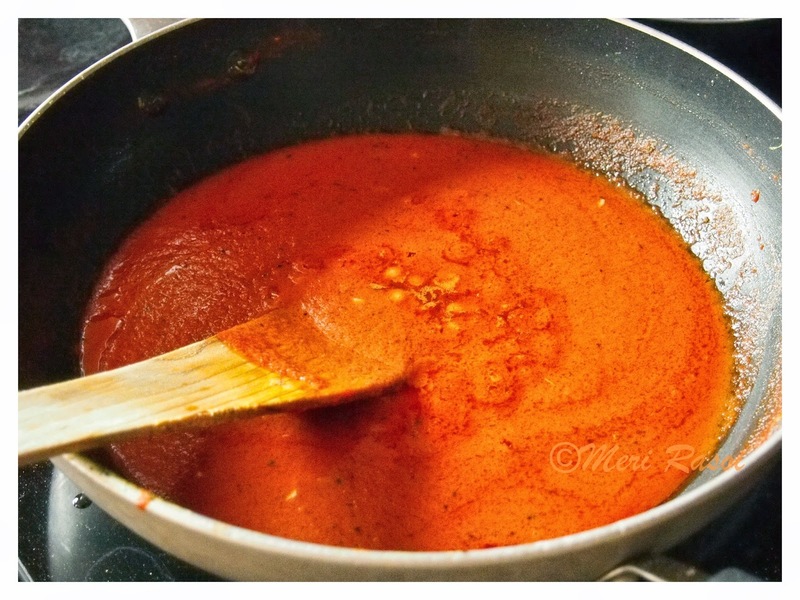 Once the tomato gravy is well cooked, add honey to the mixture and mix well. Lastly add the cream and cook for a couple of minutes and turn of the heat. Cut each of these koftas into two equal halves. Pour the gravy in a bowl. Place the halved koftas on the gravy. Drizzle some cream and serve immediately with rice or flat bread of choice. I have used Deghi Mirch red chilli powder which is milder than the regular red chilli powder but renders a beautiful red color to the gravy. If you plan to use regular red chilli powder, then reduce the quantity. I have used liberal amount of butter and cream to give the dish a rich restaurant grade taste. But you can reduce the taste as per your liking. I have used honey as the sweetening agent but you can replace it with sugar. You also adjust the quantity as per your taste. 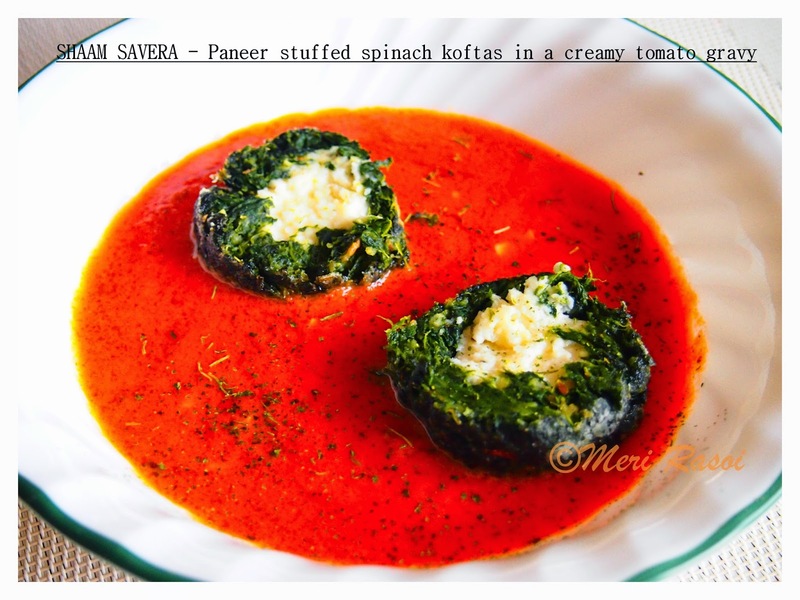 I always love Paneer,spinach kofta looks terrific in tomato gravy .Will try this dear. 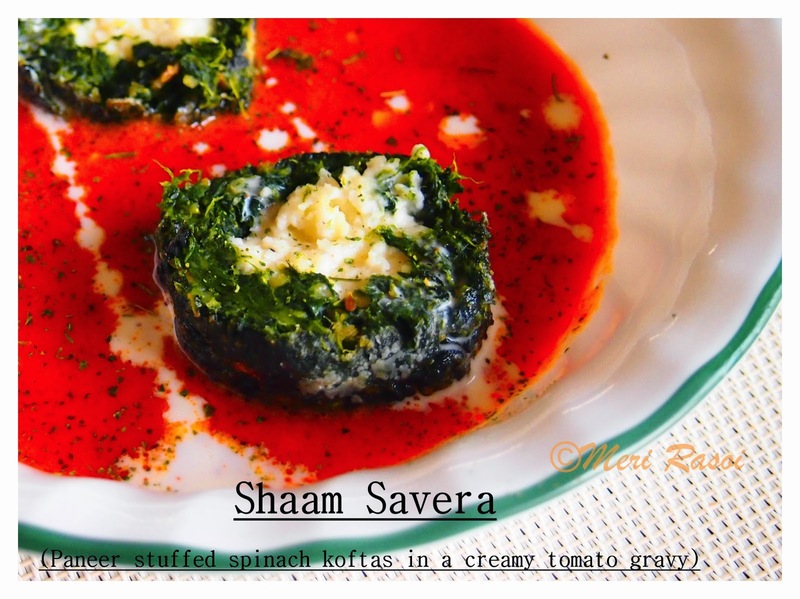 This is one of my favourite Sanjeev Kapoor dish and you have put up a fantastic looking dish. I feel your Koftas look regal and indeed it has turned out very rich and opulent. You have again done a brilliant job explaining each step of making these Delish Koftas very beautifully.Just can't take my eyes off that kofta bowl. It's mouth watering and spinach is one I use very often. Nicely presented . Thanks for sharing with us. Very well made and presented. I really love this signature dish of Sanjeev Kapoor. Want to try it out too. 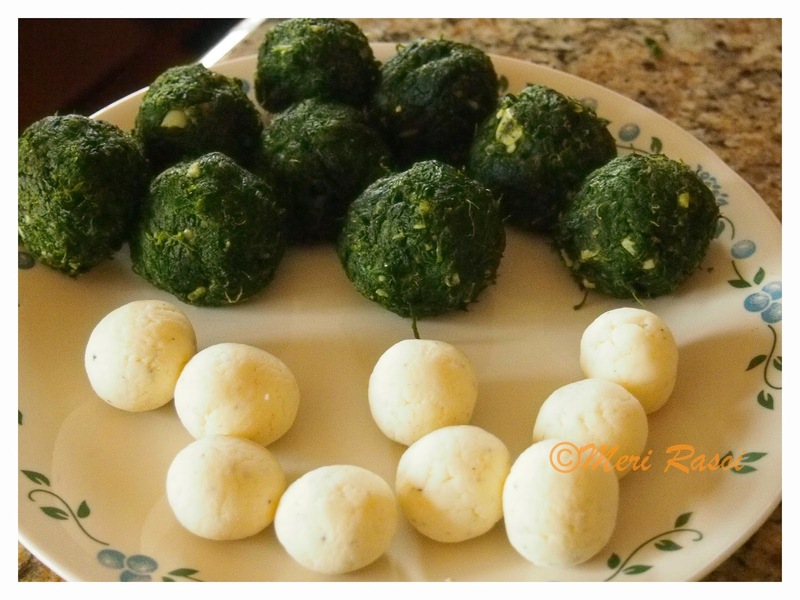 Shubha, this Kofta recipe has most of my fav ingredients. I am loving it and well explained step by step pics.. Totally agreed - tasty, rich and utmost appealing. Love its vibrancy and flavours. Picture looks very beautiful and healthy. 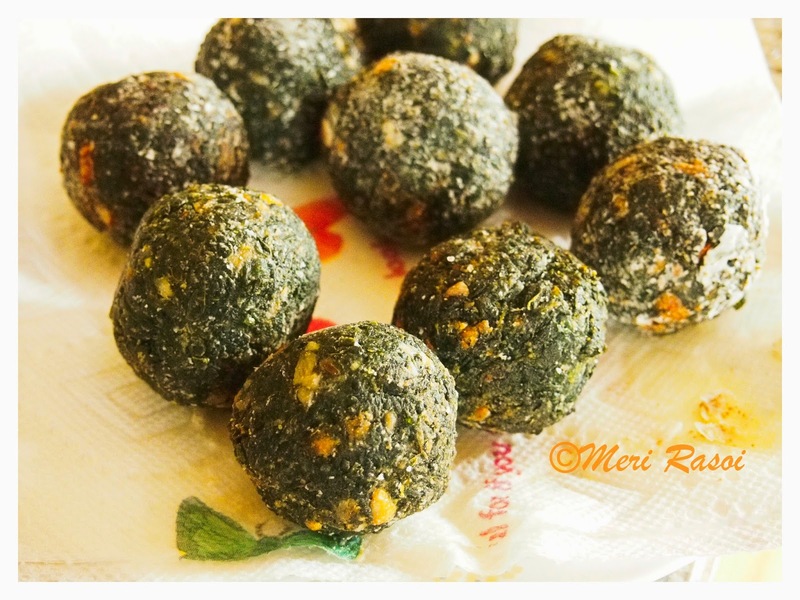 healthy recipe..I would like to try..